I originally saw this tag from Alison at Writing Wishing and loved it! So, I'll be participating in this month's OSB: Crazy Fives edition. 4. Pinterest - sorry, not sorry. 5. Baking - I'm horrible (which is why you'll never see my baking on this blog), but I love it! 1. Get married and have kids. 2. Land the job of my dreams. 3. MACO Caribbean Living 15:2. This one is so hard! I'm tagging a few of my faves! If you want to play along (and I really hope you do! 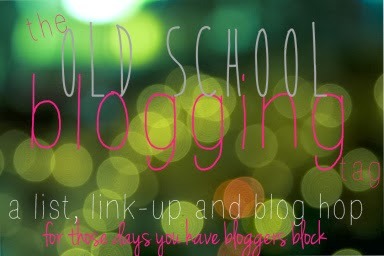 ), write a post of YOUR crazy five, grab a button, and link up with over here! Linky is open until July 25. I LOVE THE SOUND OF MUSIC! It's my favorite movie!! And are you Greek? I work at a Greek restaurant, so My Big Fat Greek Wedding always reminds me of real life!! I'm obsessed with the sound of music.. it will never get old! Why can't I sing?!! And I'm Lebanese but the cultures are so similar that my family always gets a good laugh over My Big Fat Greek Wedding! OMG I can only imagine what it's like working at a Greek restaurant.. definitely crazy huh! It seems I say literally a lot too as my kids are always saying it. No judging with The Sound of Music, it's on my list too! And we have one movie in common. And I do love The Sound of Music too! HA! I definitely like to have my cake and eat it too! I don't get people who can bake and not eat what they make? No.. it's gooey goodness in front of you, you consume it! P.S. Your kids are adorable!